Advanced analytics, blockbuster acquisitions, and exciting up-and-comers aside, one of the buzziest developments in pro ball right now is the enthusiastic embrace of fashion by the game’s top ballers. Back in the day, players made headlines just for their on-court heroics. Now they’re grabbing headlines for their off-court fits, too. And as some of the more astute athletes prove—looking at you, Game Changers—you’d be hard-pressed to find a league as rakish as this one. Fortunately, fans can also ride the wave of smarter style, now that team gear has seriously leveled up. Thanks to an evolved aesthetic, it’s now haute to show homage to your favorite squad. 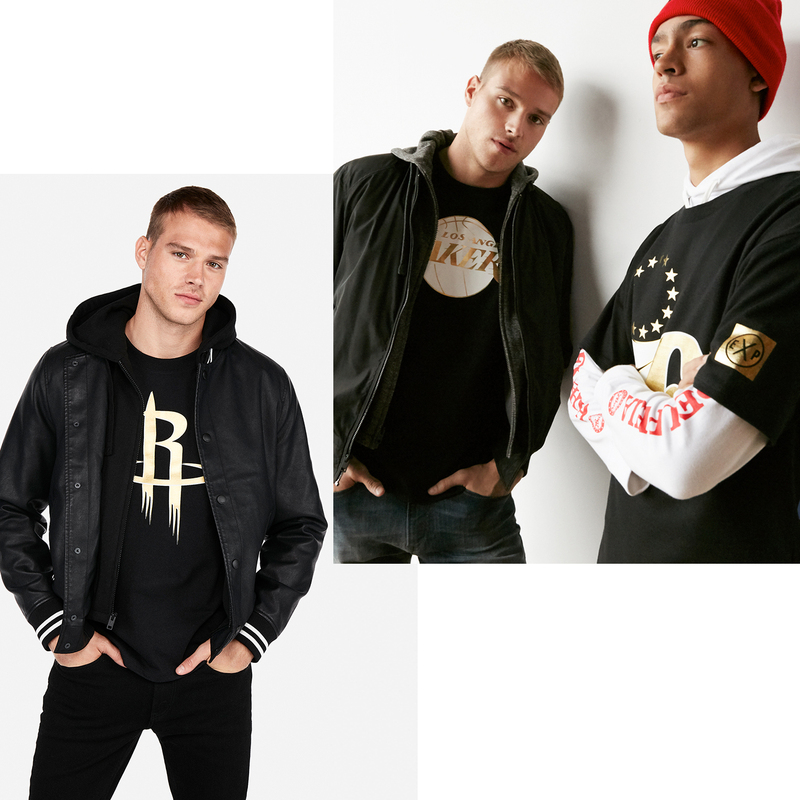 Whether you’re watching from home or snagged front-row tix, here are five slam-dunk ways to style our new collection of NBA apparel. Right now, default mode is basically monochromatic crewnecks and fail-safe chinos. 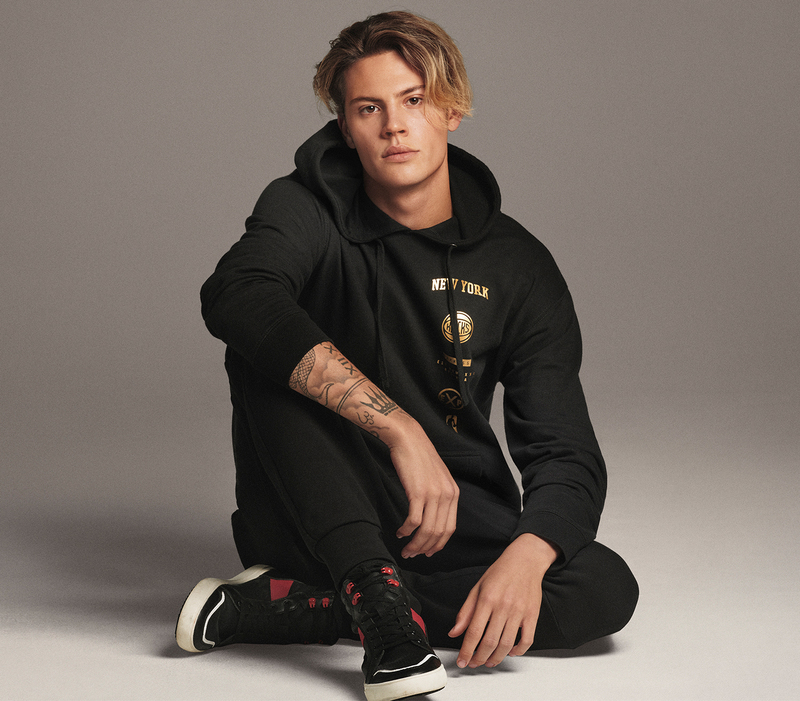 To imbue some flavor into your kits, reach for a logoed fleece or tee that boasts classic design, souped-up graphics, and other attention-commanding touches that score serious points. Tamping out spirited shades is a menswear no-no. That’s just one of the reasons we’re all-in on this collab, which spins the color wheel with some serious gusto (seriously, when’s the last time you were able to work gold into your look?). Count on this as an easy way to deke the season’s usual go-to tones. Try rocking a super-visual sports tee under a hoodie and bomber jacket for the ultimate winter move. Not only does it capture fashion’s current love affair with streetwear, but fusing sophisticated staples with upgraded basics makes for a workhouse wardrobe that’s ready to log serious minutes. Comfort staples are usually relegated to lazy days. The opposite is the case here, with super sharp fleece and sweats that should be anything but kept under the radar. Plus, they’re consistent with athleisure’s continuing rise and dominance of the scene. For days that require some calculated comfort, this is an easy layup. We’re all about more relaxed workwear, but sleeveless jerseys and ball caps are a nine-to-five fit line we wouldn’t dare cross. But, for casual work days, subbing in a team tee is a totally commendable swap-in for a button-down or bland polo. Paired with dark denim and suave-but-simple sneaks, these pieces underscore a game day mentality, even if you’re not courtside.